PUBLISHED in 2001, “Good to Great: Why Some Companies Make the Leap … And Others Don’t” is a research-based book that synthesizes what enables a company to transform from a good company to a great one. The research involved a study of 11 “good-to-great” companies, 11 “good” companies and six “almost great” companies selected from the top 500 companies listed by Fortune magazine from the years 1965 to 1995. Based on an analysis of data on these 28 US-based companies, they sought to answer the question of what separates the great companies from the rest in their respective industries. 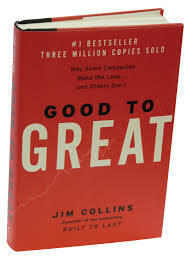 After almost five years of rigorous research, author Jim Collin and his research team answered this question by presenting “The Good-to-Great Framework” that consisted of seven concepts revolving around discipline. The first stage of Disciplined People is all about having the right leadership and the right people in the organization. The research showed that great companies had leaders (dubbed Level 5 based on a hierarchy of competence) who possessed personal humility and incredibly strong professional will. This is in stark contrast to the leaders of other companies in the study, who, while being very competent–“geniuses” even–were mostly concerned with their self-interest and self-promotion. Level 5 leaders believe that when the right people are on board, it will be easier to determine where the company should go and to motivate people forward. In the Philippines, how many business leaders can be considered Level 5? Twenty-five business leaders were recently cited as the most influential in the Philippines. Many of the names are easily recognizable since all of them head large and profitable companies. They were described as “king (of their industry),” czar, hardworking, gutsy, business whiz, frugal, workaholic, hardworking, self-made, aggressive, smartest. These descriptions seem more characteristic of the “genius” type of leader rather than a Level 5 leader. Interestingly, only one was dubbed as “humble.” Most of these leaders appointed family members rather than professional managers to occupy top positions (Flores, 2011). On the surface, many of these successful businessmen may not quite fit the Level 5 mold. Yet it is undeniable that they lead some of the most successful companies in the Philippines. Does this indicate that the Level 5 model is not appropriate in the Philippine setting? Can good companies become great without necessarily having Level 5 leaders? This is an area that merits further research. The second stage of Disciplined Thought is about maintaining faith that the company will survive while confronting the “brutal facts” of their situation. It also includes being able to pinpoint a strategy that allows the company to passionately and profitably be the best (the Hedgehog Concept). To do these, the company must have an accurate awareness of the reality of their business as well as their organization. This ability is a consequence of having the right leader and the right people within the organization. Having a Level 5 leader who creates a culture that allows committed and competent people to share and argue for their ideas would enable the organization to see clearly and therefore avoid the “blind spots of leadership” (Scharmer, 2003). Would this work in a Philippine company? One of the Filipino cultural values is non-confrontation which is rooted in the reluctance to hurt the feelings of others (Manauat, 2009). This may be a hindrance to openness, idea generation and free debate. To implement these concepts of Disciplined Thought would necessitate the creation of a safe environment to overcome the natural aversion of Filipinos to be brutally honest. How can such an environment be created in Philippine companies given our cultural values? This could be an area for further research. The third stage of Disciplined Action has two concepts: a culture of discipline and the use of technology to accelerate growth. Organizational culture is “the way we do things around here” (Deal and Kennedy, 1982). On the other hand, discipline connotes adherence to rules. However, the book qualified this definition of discipline by stating that it also means having the freedom to take action within the system in a responsible manner. In this context, discipline leads to mastery which in turn allows creativity to flourish within the framework of excellence. On the other hand, research shows that while technology is important in accelerating breakthrough, great companies carefully consider the what, when and how of technology as opposed to indiscriminate and impulsive use of technology. How do Philippine companies approach discipline and technology? The Philippines is not exactly known for discipline in the same way that Japan or South Korea is. But there are successful companies in the Philippines that do have a culture of discipline. However, the enemy of the culture of discipline is the culture of corruption in the Philippines. How this war of two opposing cultures will play out will have a big impact on whether or not Philippine companies can move to greatness. Being on the cutting edge of technology may also be a challenge for Philippine companies, not because they resist it, but because of the substantial costs of developing or acquiring new technology. The last concept is about how transformation occurs. Research indicates that the accumulation of the right steps taken one at a time accelerated the breakthrough of good-to-great companies. In fact, the “good-to-great” companies did not even have a name for what they were doing at the time. On the other hand, here in the Philippines, companies often like to launch programs, campaigns and initiatives with much hype. When the promised results don’t work out, it often leads to cynicism which increases resistance to change initiatives (Itchon, 2010). In summary, can the Good to Great concepts work for Philippine companies? They face tremendous challenges but the concepts laid out in the book are relevant. Who can dispute that personal humility, strong professional will, confronting reality, passion, discipline and technology can help Philippines companies be successful? However, given that the Philippines is an emerging economy, is this the right formula for Philippine companies? Further studies in Philippine setting are needed to answer this question. What is a “Great” Company? The book has received accolades from the business and academic communities in the US. And while a few may criticize the research methodology, it is an advantage that the book is based on empirical research rather than anecdotal experiences that underlie many management books. Therefore, it can be said that the findings and concepts that have been presented in the book have solid basis. What then can be the weakness of the Good to Great concepts, if any? The weakness lies beyond its research and theorizing process. It lies in its definition of what a great company is. They defined a great company by its financial performance (mainly the ratio of cumulative stock returns to general market) and in so doing gave a narrow definition of greatness. The findings therefore are relevant for companies who would want to succeed along these financial measures. But financial performance is not the only parameter of greatness of a company. In fact, some may view accelerating financial gains beyond normal expectations, however deservedly earned, as greed (James, 2002). Senge, Smith, Kruschwitz, Laur and Schley (2008) have a more radical view: they say that “There is no viable path forward that does not take into account the needs of future generations (2008, p. 9).” They point out that most businesses are creating unsustainable systems that spew waste and toxicity into the environment and that therefore, businesses must be redesigned so that it supports a sustainable world. From these viewpoints, the greatness of companies is measured by how they contribute to social progress and sustainability. In comparison, financial performance as a measure of greatness seems trivial. In consideration of these issues, there is a need for further research to develop a conceptual framework for greatness of companies along these parameters. What conceptual framework underlies sustainable businesses that provide shared value? What are the factors that distinguish them from other companies so that others may follow their lead? Answering these questions would surely help in directing the way for companies to breakthrough, not from good to great, but from greed to good. Deal, T. E., & Kennedy, A.A. (1982). Corporate cultures: The rites and rituals of corporate life. Reading, Massachusetts, U.S.A.: Addision-Wesley. Porter, M. E. and Kramer, M. R. (2011 January-February). Creating Shared Value. Harvard Business Review. pp. 62-77. Senge, P., Smith, B., Kruschwitz, N., Laur, J. & Schley, S. (2008). The Necessary Revolution: Working Together to Create a Sustainable World. New York, U.S.A.: Broadway Books.